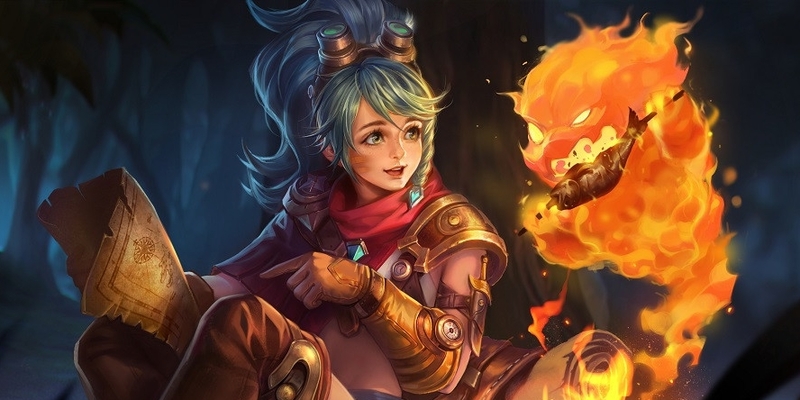 Guide for the hero Roxie, a character in Arena of Valor (AoV). Included are Roxie’s abilities, statistics, attributes, strengths, weaknesses, and more. Every 40 maximum HP grants Roxie 1 ability power. On every 3rd normal attack, her mana is restored by 8% and Agnie puts a mark on the target that lasts for 5 seconds. Roxie’s attacks do not have to be on the same target to trigger the marking or mana regeneration effects. Roxie will mark every target damaged by her normal attack when activating the ability. Roxie’s boots are infused with the spirit of fire while consuming mana, and flames ignite under Roxie’s feet as she walks. Each flame lasts 2.5 seconds and deals 20/26/32/38/44/50 (+0.16 AP) magic damage every 0.5 seconds to targets nearby (stacks up to 3 times.) If an enemy is marked by Agnie, Roxie’s health is restored by 1% of HP she lost (2% if the target is an enemy hero), but this effect does not stack. Damage and healing are doubled within 2.5 seconds of activation. Overlapping areas of fire by moving slowly or standing still will cause the damage to stack. Roxie spawns an area of fire every 0.5 seconds while the ability is active. Roxie spends 16 mana each second that Wild Fire is active. Wild Fire will remain active until the ability is selected again or Roxie runs out of mana. Roxie gains 25% movement speed and a flame shield that absorbs 150/200/250/300/350/400 (+6% of her maximum HP) damage and lasts for 3 seconds. Roxie maintains the movement speed boost even if the shield is destroyed. Agnie reaches out, marks, and pulls the first target it touches toward itself for 1.5 – 2.5 seconds ( The closer it is, the longer the duration), dragging the target along as Roxie moves. The cooldowns for Wild Fire and Blazing Shield are immediately reset. While being dragged, the target ignores obstacles and is immune to other control effects. The target also takes 40/60/80 + (+4/5/6% of target’s current HP) magic damage (maximum damage of 300). Target is stunned while dragged by Agnie’s Grasp. Will not drag/stun epic monsters. Cannot be cleansed or shortened by resistance. Our recommended order for Roxie abilities as she levels up. See all of Roxie’s item builds. The healing effect does not activate while the enemy have a shield, like crest or astrid,even if they are marked. I’m still confused about the heal from her first skill. Is it Roxie’s total HP lost, hp lost per second, or something else? How is Skewer a good green Arcana on her? I don’t think she profits from Armor Pierce. It should be either the standard Indomitable-Benevolence-Valiance combo or, to make more use of her passive, Indomitable, Guerilla and Flurry (This also increases her burn damage a bit). This gives her +26% Attack Speed and a lot of mobility. Both I find very helpful on her. That is a good point. I have switched it to Valiance, though I debated between it and Flurry for awhile. Your set up is very nice as well. when will she be released on SG sever? Her ult most definitely drags and stuns minions and some jungle monsters. However it does not appear to work on bigger monsters ex. (abyssal dragon). You are right. Thanks for catching that!